An online portfolio is your digital calling card as an artist. Promoting your artwork in person and online is all part of being a creative entrepreneur and running your own art business today. Your online portfolio is the first place that people look to see if they want to go forward with acquiring a piece from you. That's why you should take the time to get it right. Collectors, gallerists, and potential buyers look online to verify your history and credentials as an artist, as well as to find and learn more about your work. It’s come to be an expected part of an artist’s business. So, how do you lay this foundation once so you save time in the future and ensure that your portfolio is working for you? Use these tips for making a standout digital portfolio and how to get eyes on your work—plus our favorite tools to help save you time. One of the top mistakes artists make when it comes to their online art portfolios is not taking care of the basics. The truth of the matter is that if you want to make a living with your art and you don't cover the bases of your digital portfolio, you could end up looking like an amateur—even if you have a whole stockpile of masterpieces. Why work extra hard to convince buyers that you’re a credible, professional artist when you could just make a few tweaks to your portfolio and showcase your strengths from the start? Artist Julia Ibbini embedded her Artwork Archive portfolio onto her Squarespace website. Why spend hours, days, and weeks, creating something incredible if the photo doesn't convey that? Our advice? Avoid fuzzy, dimly lit, or poorly cropped photos. And, be sure to watch out for any distracting shadows, camera flashes, or backgrounds. Make sure that your camera settings reflect the true colors of the work and color correct the image if need to be to present an accurate image. Honor your work and your career by investing in quality photography or use these tips to photograph your art like a professional. Beyond your portfolio, you have an entire online presence that tells a story about who you are as an artist and helps sell your art. And we’re willing to bet you put a lot of work into those outlets! So when a buyer views your portfolio, clicks on one of these links hoping to view your social media or sign up for your newsletter and the link is broken, they are immediately cut off from learning more about you. Not only does it leave a bad taste in their mouth, but they may not want to spend the time figuring out what to do next. All that work was for nothing, and your credibility took a hit at the same time. Taking the extra minute to double check that your links work can make all the difference. What if a potential buyer or gallerist asks about your most recent work and you have nothing to show? You are pretty much guaranteed not to make the sale. Just like the Scouts, your motto should always remain the same—be prepared! Often times, it feels like the opportunities just aren’t coming. But is that because there aren't any opportunities or because we aren’t ready? Ready or not, opportunities will come. Keeping your portfolio stocked with your latest and greatest pieces allows you to jump on any opportunity that presents itself. When it comes to your portfolio’s design, clean and professional always should be top of your list. No distracting backgrounds. No crazy fonts for large chunks of text. Everything should be easy—easy to read, easy to navigate, easy to understand quickly who you are as an artist. And while you may want to go wild with design elements, remember that you aren’t trying to sell anyone on your web design services. You are trying to promote your art! Therefore, make your artwork the star of the show. Did you know that artist About pages are often the most frequently visited page on an artist's portfolio? But, one of the most common obstacles artists face is how to write their About page. When you work in large or conceptual ideas, it can be difficult to find the most succinct, convincing and accurate words to describe ourselves and the work that we do. You want to remain authentic to your vision, but you also don’t want to sound too self-promotional or inflated! Take a look at these tips on how to craft your artist About page to win over collectors. You’re only as good as the artwork you present. At least, that is how it will feel to those looking at your portfolio. Remember, the goal of an art portfolio is to represent your technical ability as an artist—your core strengths, range, and experience in the art world. That’s why it’s important to highlight what you consider your best works—work that will help you send the message that you are outstanding in your field. An example of artist Krista Reuter’s embedded Artwork Archive portfolio on her Wordpress website. The more professional your portfolio looks, the more professional you appear as an artist. That’s where detail comes in. Including things like titles, dimensions, mediums, creation date, sale price, and the story behind your art shows that you take your work seriously—and it also gives you an edge when presenting your portfolio to clients. There’s always more to a work than meets the eye. And let’s face it, whether you’re trying to gain representation or sell your work, no gallery director, curator, or collecter likes to chase down artists for information. These are the details collectors need and want to buy your work anyway, so why make it harder for them to find it? Art is so much more than paint on a canvas. Every artwork has a story: the inspirations, the journey to creation, the care and devotion taken with every brushstroke, the message it’s telling, showing history, and more. The same goes for you as an artist! You have a unique perspective. Your passion, motivations, personality, upbringing, education, experiences, and the issues you care about have all had an impact on the kind of art you create. Telling this story helps sell your art. Share this story through your online portfolio, and you will connect emotionally with the people who care about this story, too. That being said, a good online portfolio will give you room to share. Whether it’s an About section with images, a spot for a short bio, a way to share news, or the ability to group your works into collections, your portfolio should help you stand out as an artist, not hide your voice. Artist Holly Ann Friesen embedded her Artwork Archive portfolio on her Weebly-powered website. Don’t make more work for yourself! Why not find a way to manage your inventory and your portfolio at the same time? Take a look at Artwork Archive, an all-in-one business solution for artists. Not only can you keep track of your whole art inventory online, the important details attached to each piece, and the current locations of your work, but you can manage your whole art business—clients, shows, schedules, sales, reports, and online art portfolio—all from one, intuitive tool. Plus, Artwork Archive’s latest website integrations let you effortlessly sync the online portfolio of your artwork (and all of the artwork details stored on Artwork Archive) to your own artist website including Squarespace, Wordpress, Wix and more. This saves you endless hours—time that you’d probably rather spend in the studio, by allowing you to enter a piece’s information once, and only once! With a click of a button, you can sync this online gallery with your running inventory of works. Information flows from Artwork Archive to your website, so your online portfolio is always up-to-date and ready to impress buyers when you organize your inventory on Artwork Archive. 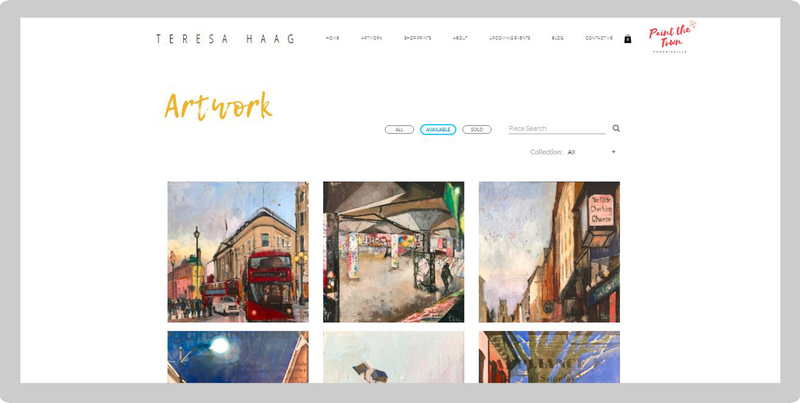 An example of artist Teresa Haag’s embedded Artwork Archive portfolio on her Wix website. You’ve followed these tips, made some updates, and now your online portfolio is on point. Fantastic! So, what’s the next step? You have to promote it! The internet is vast and competition is fierce. The odds are, people won’t just happen upon your artist website accidentally. Sometimes you have to give them a gentle nudge and put it out there for the world to see. An email signature is an excellent way to improve the marketing power of every email that you send. By providing a link to your portfolio, you’re giving buyers, galleries and other contacts the chance to see more of your amazing work that they may not have had otherwise. Seeing ad, after ad, after ad, is not very exciting for an art customer. But, the fun and engaging content you post on your blog can actually help sell your art by creating goodwill towards your business. Stick to the 80/20 rule: 80 percent entertaining, 20 percent promotional. Then, use that 20 percent to promote your online portfolio and drive sales in a fun way. You never know when you’ll meet someone interested in your work. Show them just how professional you are and further the relationship by whipping out an impressive business card with the link to your portfolio. Don’t get lost in the pack, either! Take a look at the secret to effective business cards. One thing is clear—social media is redefining how the art world does business. Another great form of content marketing, social media allows creatives to express themselves with more liberty, frequency, and intimacy. And while you should be careful not to overdo it with the promotion, calling on fans to peruse your portfolio can help drive sales. Get some post ideas with these Instagram tips. Newsletters can be incredibly powerful tools for artists. Debra Joy Groesser sells a painting off every monthly newsletter she sends out. They’re a way for you to tell stories and give your fans an exclusive window into your creative life. While delighting and exciting your fans with these newsletter ideas, don’t forget to direct them to your portfolio with a strong call to action. The great part about having your art portfolio organized with Artwork Archive is that you can pull it up with any device. And, everything is up-to-date, so you can impress collectors and answer questions on the spot. The more people who see your artwork, the more likely they are to fall in love with it. 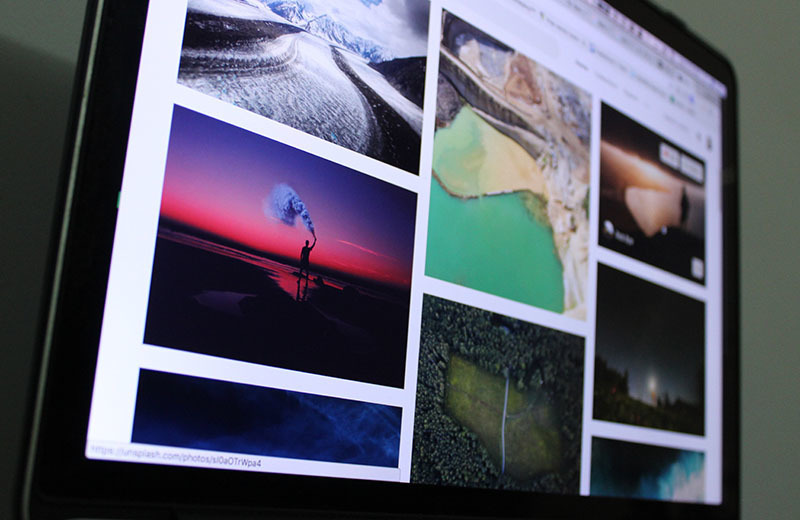 A professional online portfolio is the key to wowing these potential buyers. But, don’t make more work for yourself than you have to! Skip the double data entry, disorganization, and lengthy coding projects by embedding your Artwork Archive portfolio directly onto your artist website. You’ll be able to present your work in the easiest, most professional way possible, while all at once keeping your art business organized and thriving. Take the time you just earned back and spend it doing what you really love—making art. Want an easy way to manage your online art portfolio? Get started with a free trial of Artwork Archive. Does Your Artist Twitter Account Have What It Needs? Want to use Twitter to help your art business thrive? Start with these 5 easy elements to impress buyers on your artist Twitter account.